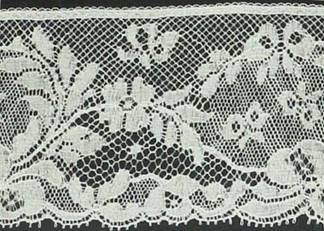 All of the French laces are considered cotton lace but will contain up to 10% nylon for strength. Iron the laces at the beginning of the cotton setting on the iron not higher. Never saturate with spray starch instead a light mist is all that is needed. 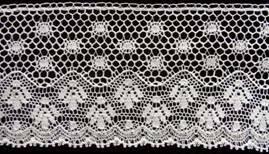 The laces are grouped in "families" showing the different widths of edgings and insertions that match. The cream laces are a soft cream and not as dark as ecru and will suit ivory fabric as well as cream.